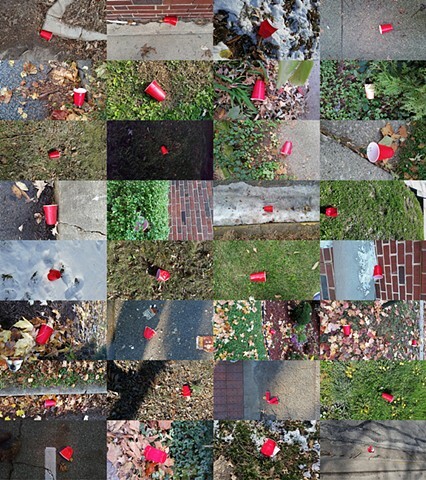 This photographic collage is made of images of discarded red Solo cups taken by the artist during her first eight months in residency at the Univesity of Illinois at Urbana-Champaign. The Solo Cup, a locally invented and manufactured product was created by Robert Leo Hulseman in the 1970s for his family’s Solo Cup Company which employed hundreds of Champaign county residents until it was sold in 2012. Today the red plastic cup maintains an important role in local culture.